This week we’re exploring the ways that science and technology are changing sports, on and off the playing field. 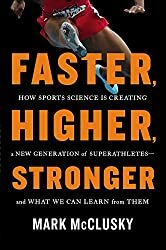 We’ll speak to journalist Mark McClusky about his book Faster, Higher, Stronger: How Sports Science Is Creating a New Generation of Superathletes – and What We Can Learn from Them. We’ll also get the scientific perspective on sports supplements with Dr. Bryan Chung, founder of Evidence Based Fitness. *Josh provides research & social media help to Science for the People and is, therefore, completely biased. This entry was posted in This Mortal Coil and tagged Bryan Chung, Evidence Based Fitness, Faster Higher Stronger, Mark McClusky, Podcast, science for the people, Sports, When Supplements Work. Bookmark the permalink.